Schools will be flooded with hundreds of extra pupils in the next two years, heaping pressure on stressed-out staff and creaking classrooms. Recruitment across the north and north-east has been a major problem, with teaching vacancies frequently re-advertised and authorities even flying to Canada and Ireland in the hope of attracting staff. In some places, such as Longhaven, near Peterhead, schools have been mothballed due to the difficulties in finding teachers. And in Aberdeen, recent figures showed 2,846 staff days have been lost due to teacher stress since September last year. 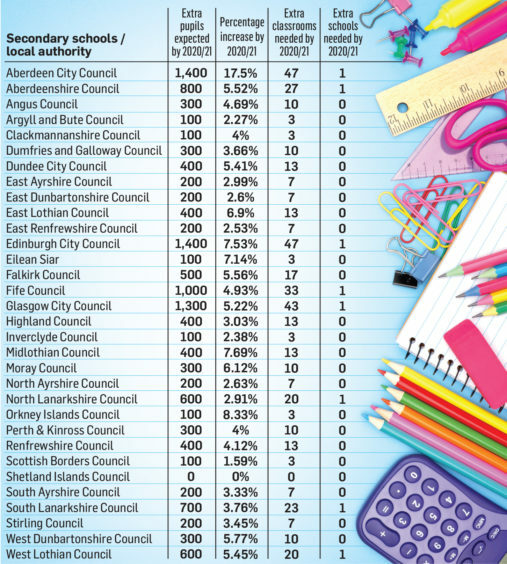 Now new figures, published by Scape Group, have suggested secondary schools in Aberdeen will experience one of the highest increased rolls in Scotland over the next two years – with 1,400 extra pupils. That is the equivalent of one new school, or 47 classrooms. In Aberdeenshire, 800 extra pupils are expected by 2020/21 – equating to 27 new classrooms, or one school. A further 400 will join secondaries in the Highland Council area, while Moray Council – which is already building one new school with another two in the pipeline – is predicted to have another 300 pupils on the rolls. According to Scape’s The School Places Challenge 2019 report, 13,600 additional pupils will join the secondary system by 2020/21. Last night Councillor Martin Ford, who sits on Aberdeenshire Council’s education committee, said the figures indicated an “extraordinarily rapid rate of growth” that would be a challenge. He said: “It is not just an issue of space, although it will require additional space, but also one of teaching staff and there are budgetary and resource implications for that. 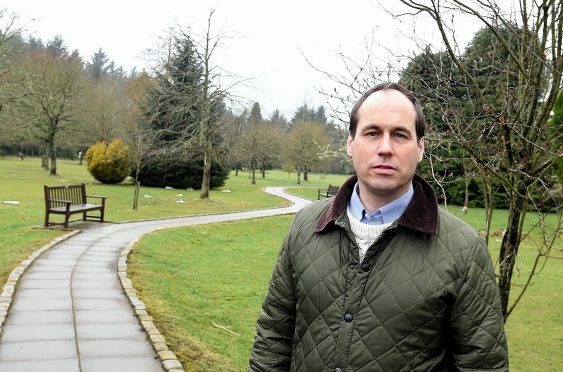 North East MSP Tom Mason – who is also an Aberdeen councillor – said he hoped the new Lochside Academy and plans for a new secondary at Countesswells would ease the pressure, but admitted the study was worrying. “This does highlight the huge challenge faced by the council in filling those classrooms with teachers. Staff shortages have led to a huge increase in stress-related absence in the last year,” he said. But city council co-leader Jenny Laing said the authority did not recognise Scape’s figures, with their own data suggesting a 1,188 rise by August 2021 – which she insisted was provisioned for. Education committee member Martin Greig however, was concerned by the data and called for action to reduce pressure on staff and bulging classrooms given the ongoing housing developments in the Greenferns, Countesswells and Grandhome areas of the city. “The council needs to get a move on with planning and providing suitable accommodation for new pupils,” Mr Greig said. Larry Flanagan, general secretary of teaching union EIS, said the oil industry’s tendency to drive up wages meant that it had been difficult to recruit teachers to the north-east. In Moray, the council has already committed to covering the rise in school pupils by building a new Linkwood Primary in Elgin and planning for two others to deal with the population boom. An expanded Lossiemouth High School is also being built that will have an increased capacity of 800 pupils. But Elgin City North Councillor Frank Brown said the prospect of a further 300 pupils would heap pressure on the already over-burdened teachers. “There is already a big problem with teacher recruitment in Moray at the moment for certain subjects and it is a bit like a postcode lottery for pupils at schools on what subjects are available to them,” he said. “We have specific problems with modern languages for example and to have 300 more children could restrict this availability even more. Councillor George Alexander, a former teacher, however was “fairly confident” that Moray’s eight secondary schools would have capacity to cope with the projected figures. Councillor John Finlayson, chairman of Highland’s Learning Committee, echoed Mr Alexander’s stance.